Virginia Jensen, Sharon Goins. Not pictured, but present were Danie Becknell and Joan Maxfield. Not in attendance are Jim Griggs and Patti Siemental. The Morgan County Literacy Foundation has taught a lot of people to read, but they think they can do more, said board member Ruth Rusie. With a $15,000 gift from Home Bank and a 50 percent match through the Lilly Endowment’s Giving Indiana Funds for Tomorrow initiative, it will be a little easier for the group to expand its reach, Rusie said. Rusie said a director would be tasked with the organization’s clerical work, recruiting, fundraising, promotion and coordination with the board. Home Bank President and CEO Dan Moore said the gift is a perfect fit for the types of projects the bank is trying to help promote. “What we’ve learned is that there is a correlation between poverty and education, especially reading skills,” Moore said. “It’s an eye-opener to me how many people are challenged to read a newspaper or read a book. The bank has also given money to the ReadUp program, which helps elementary-aged children improve their reading skills. Bank employees are also supported in their decisions to volunteer for the ReadUp program, Moore said. “Ten people, at one time, were reading,” Moore said. “That’s more than 10 percent of our staff leaving during the day to go help the children. You might ask, how do we do that? We cover for each other. The gift was part of a larger tithing program the bank started in July 2012. The bank helps nonprofit organizations selected by an anonymous committee of employees, pledging to give 10 percent of its profits to projects targeting the most critical needs in the community. 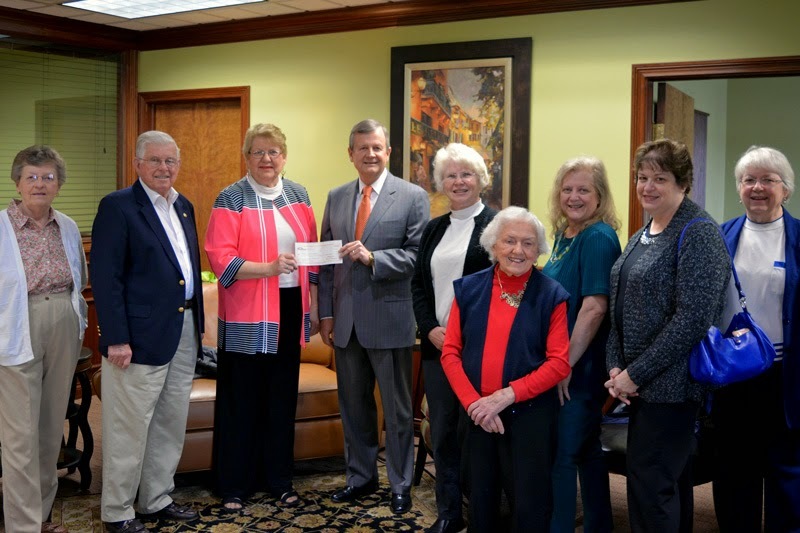 The bank has given to multiple projects to date, including free cancer screenings at the Morgan County Fair and donations to Morgan County Weekday Religious Education and Habitat for Humanity of Morgan County. It has also helped fund ReadUp in both Martinsville and Mooresville. As part of its gifting program, the bank is also underwriting an initiative to address the challenges of poverty in Morgan and surrounding counties. The bank has given away about $140,000. Moore said the bank is able to give money back to the community because of the institution’s organization as a mutual. A mutual bank is owned by its customers and doesn’t have to use any of its profits to pay dividends to stockholders. All of the bank’s profits are put toward its cash reserves, which the federal government mandates banks to keep. Banks are required to keep 8 to 10 percent reserves, depending on the risk of their portfolios. Home Bank entered the 2008 recession with a 13 percent reserve, and it still has a 13 percent reserve, Moore said. The board decided the best way to give back was to give right off the bottom line. The bank formed a committee of employees and will be giving that committee 10 percent of the bank’s earnings each quarter to give back to the community. To read the original article visit the Reporter Times website.